SewWonderful: How Did That Happen? This started out as a project to use up wool scraps but suddenly I was spending just over $18 dollars at Craft Warehouse for more wool yarn to coordinate with just the blue and variegated Kool-Aid dyed scraps for a yarn basket or bag that could sit in my living room without clashing with the decor. Now I have more leftovers to use up. This project was a learning experience. 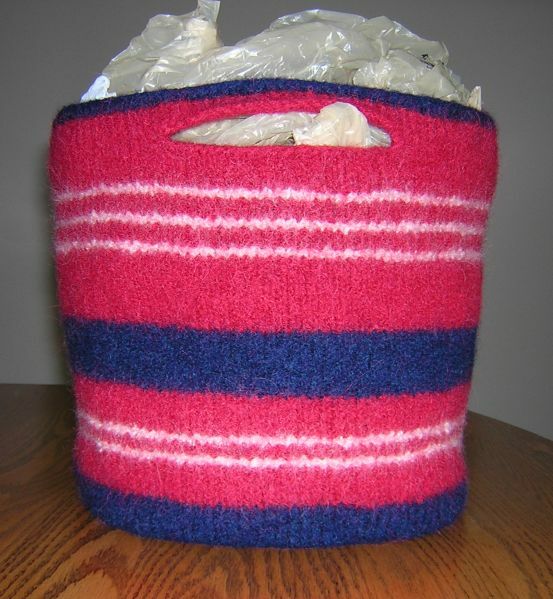 I have wanted to try felting/fulling a knit project and knitting basket/bag seemed perfect. 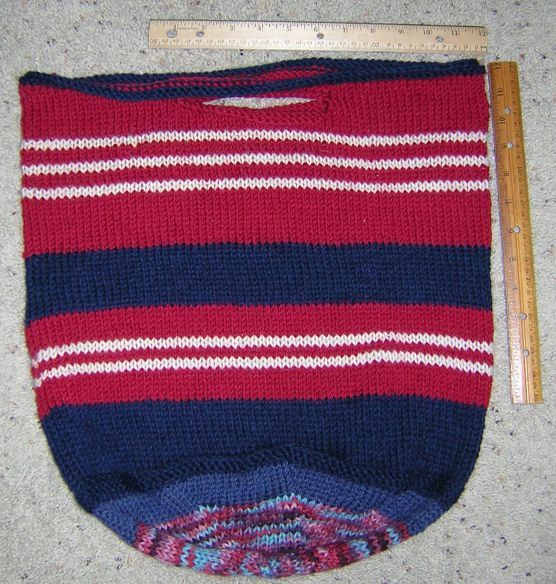 My past projects were either unintentional or a sample flat knit that has now qualified for potholders. 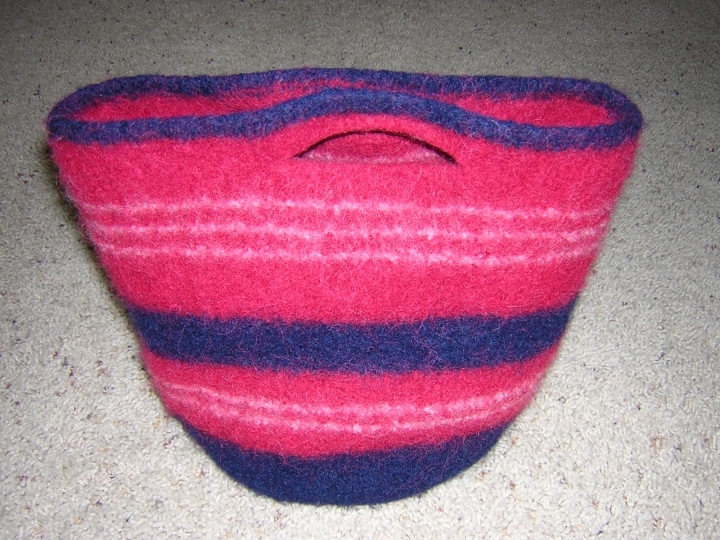 After searching Ravelry for felted bowls and baskets, I settled on A Petite Felted Bag by Ann Lim. 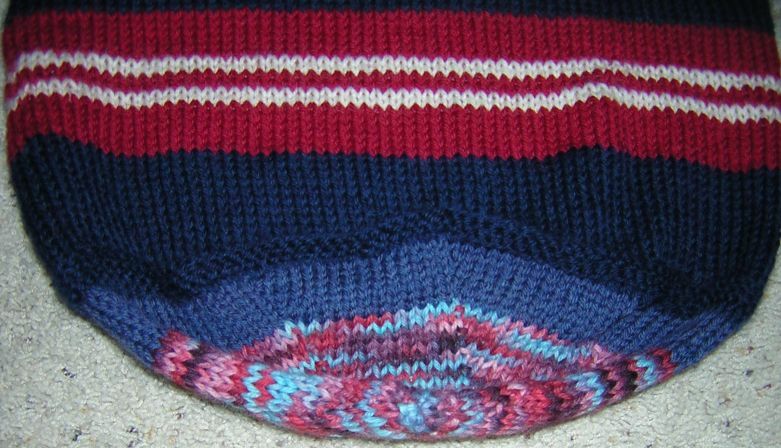 Wanting a bigger version, I began with the 4 stitches/8 sections on the bottom but increased until I had a round base of 128 stitches and then worked upwards as instructed. I hit the panic button when I realized that the rather wimpy Cascade 220 worsted weight yarn was too fine to felt into a sturdy basket with only a single strand as instructed by the pattern. A Google search turned up another bag with a round base and buttonhole handles. Figuring if I ended at the top with the brick red yarn that had a heftier hand for worsted yarn, I might have a bag that would be sturdy enough for a knitting project. I used the new pattern as inspiration only as I was working from the base up. 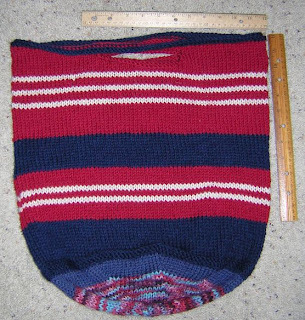 Figuring that I needed enough height to prevent the base from pulling up, I continued knitting until the my bag was 15 inches tall. I chose not to use much of the off-white Lion Brand Fisherman's Wool because I was unsure how well it would felt/full. The variegated yarn in the base is the same but dyed with Kool-Aid. I was pleased to find that it is very densely felted and with only one cycle in my top-loader. The felting/fulling process began with soaking the bag in a pan of warm water with 2 cups of white vinegar to soften the yarn. After 40 minutes in the vinegar bath, I dumped the bag in a bed pillow cover with a zipper (past felting experience in only a mesh bag resulted in much wool lint clogging our 60 year old pipes requiring a visit from a plumber) and put it in my top loading washer with a heavy navy towel. On the lowest water level with very hot water, the contents of that load went through a very turbulent agitation for 9 minutes, followed by a cold rinse. The results was very satisfactory. The bag is now 10 inches high and 32 inches in circumference and stuffed with a round bowl in the base and nearly all the plastic shopping bags I could find in the house. Drying may take awhile, though. Our pleasant sunshine is now drippy rain. I may have to set up a fan to speed up the process. While I am posting on my project, I am going to use some space to comment on the terms felting and fulling. If one wants to be terribly accurate and base their word usage on the ancient process of thickening woolen fabrics after weaving, fulling is the correct term. Felting actually is the matting together of non-woven fibers. Unfortunately, word usage changes the meaning of words and now, knitters commonly refer to felting knits to make them denser and sturdier. One would have a hard time finding a current book on the process using "fulling" in the title. Felting communicates as few understand fulling and its history in the textile industry. June 21, 2013 Update: Recently, the bag was soaked in Shaklee's Basic H and hot water for a half an hour and then agitated again. The bag is now smaller and is stiff enough to stand on its own. Petite but the bag is now a perfect small project bag at about 7 inches tall and 6.5 inches across the base. The pattern recipe has not been updated with new pictures. With a recent gift of off-white wool yarn lurking in my stash, dying and felting another bag are tempting me. A perfect project for lazy summer days! The bag turned out wonderfully!!! I was one of the yahoo peeps who didn't respond to your question posted, as I hate using Cascade. It just doesn't full like I like it: tight, NO stitch definition, linearly. I love to use Galway or Paton's....and then bamboo mixes are pretty (fabric comes out softer but it's beautiful!) and alpaca is the prettiest...but who wants to full alpaca?!!!! Christine, keep me posted on fulling Cascade 220. 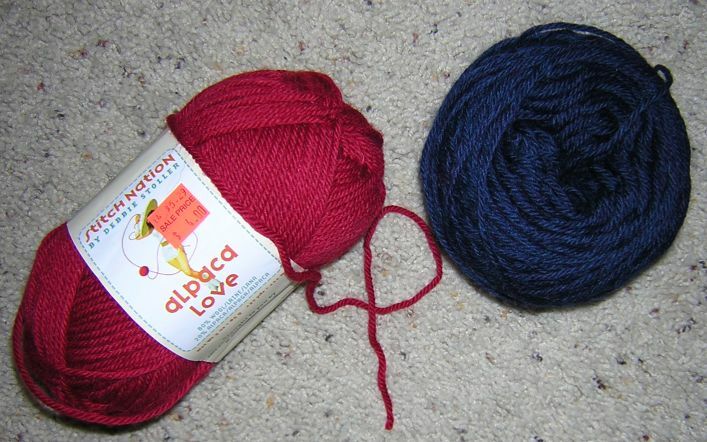 I liked the Alpaca Love so much I may have to go buy the rest that was on clearance at Craft Warehouse, but I already have some Stitch Nation Full o'Sheep for the next fulled bag project.